Apple's long-overdue stab at a cloud editing service has finally come to, well, some of the masses. 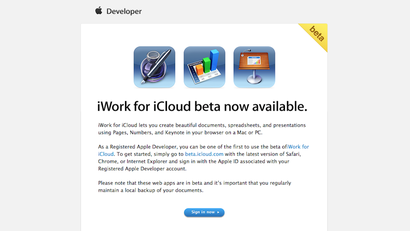 If you happen to be an Apple developer, iWork for iCloud is available to you right now. The new, cloud-dwelling incarnation of the iWork suite will finally catch Apple up to Google and Microsoft office, which have long been dominating the field. Plus, iWork should even work much more smoothly with Microsoft Office, letting Apple slowly but surely get their claws in wherever they can. Since the service is still in beta — a very early beta, at that — Apple recommends backing everything up, which you should probably be doing anyway. You can head over here to try it out.